Cake and peace are two amazing things and combined it all becomes a peace of cake. Yes again a fun play on words. and on this t-shirt witch comes in all kind of fun colors you can see a yummy piece of cake and the cake is holding a peace sign. Maybe world peace all starts with a nice piece of cake. This women’s cake t-shirt comes in sizes Small – XLarge and as said before in many fun colors like pink, green, blue and more. 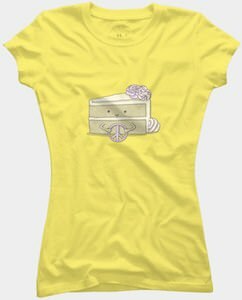 Get ready for come cake and peace while wearing this fun Peace Of Cake T-Shirt.